In the midst of the dot-com boom, Telindus, a Belgian IT company, found itself in desperate need of more space. They also wanted to use the project to project their corporate identity. Working with architect Jo Crepain, they created a 20,000 - square meter - rectangle - containing offices, meeting rooms and a restaurant - placed against one of the existing buildings. 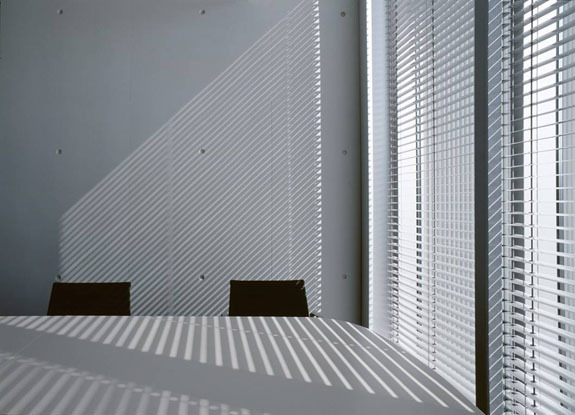 "Office buildings contribute to the clear identity of a company" said Crepain, and should "reinforce the image to a good and tightly structured basis or architectural work-platform for their product". Key elements of Crepain's design were transparency, light and connection to the outdoors. The resulting transparent addition has a structural quality that links to the lush surrounding park. 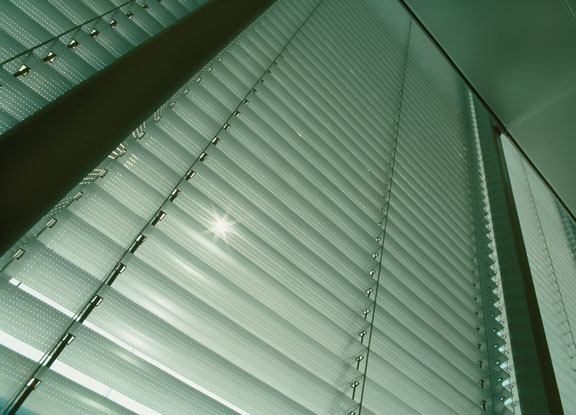 The walls of glass allow light deep inside the 15 m wide x 40 m long space. 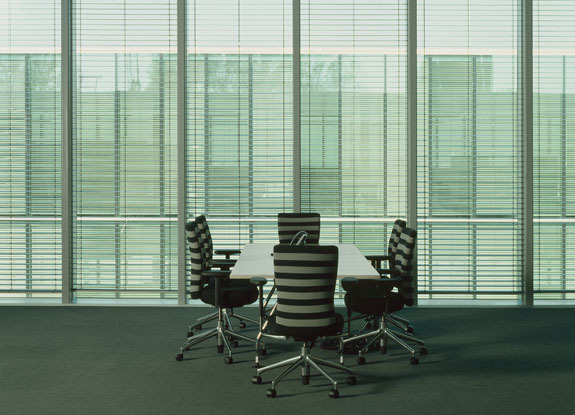 The building employs horizontal blinds by Hunter Douglas to manage the natural daylight and heat gain from the walls of windows. Workers may let in as much or as little light as needed. 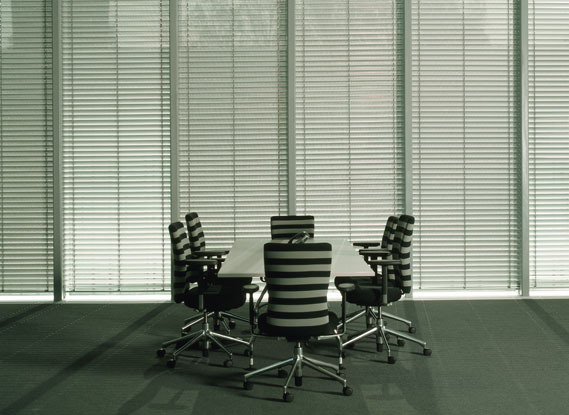 Composed of the hardest aluminum alloy in the industry, Hunter Douglas blinds contain up to 95% recycled aluminum content. 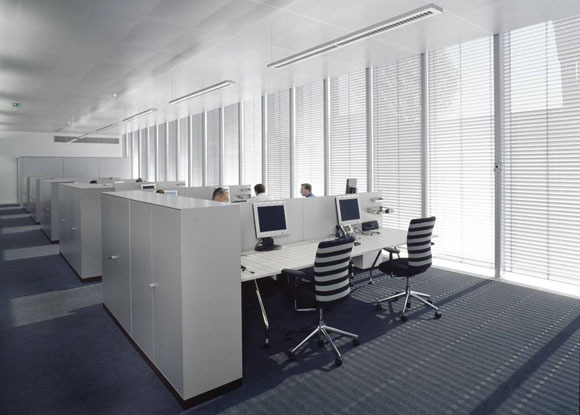 The blinds are also coated with an anti-static, dust-repellant paint, important in offices full of sensitive workstations and servers. Throughout the project, horizontal themes create a clean, modern look, starting with the building itself which stretches tightly along the landscape. In addition to the metal blinds, thin white planes of long rectangular conference tables draw occupants' eyes outside. And while the excellent views of the surroundings might tempt workers, the natural connection also makes them healthier and happier while inside.